Today is the 70th anniversary of the D-Day landings and last September on International Peace Day we went to Arromanches in France to draw on the beach 9000 silhouettes to visually represent the lives lost and what happens in the absence of peace as such a number is unimaginable. The drawing represented all combatants and civilians that lost their lives on that day. It was designed by Jamie Wardley and Andy Moss and involved many volunteers and lots of heart to make the piece. This short film is a sneak preview by Finn Varney from Aberrations films who joined us on our trip to France. Thank you to all these those involved as this art piece continues to touch peoples hearts. 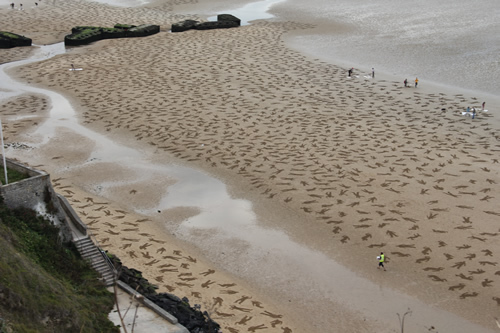 Thank all of you who were responsible for drawing 9000 silhouettes on the beach to visually represent the lives lost during the D-Landings at Normandy. Hopefully, all the Veterans who are still alive will see this and know that there are those who have not forgotten. Hi Jack. Thank you for your comment. Many of the veterans have seen it. There was a chap there on the day and it has been in many veteran magazines. Very sobering.